Yes I changed the name of the workout, but its mine so I reserve that right. “Why Pumpkin Pie?” I once heard someone say “think of the best pumpkin pie you ever ate and now think of the worst, there really wasn’t that much difference was there.” All 3 of these movements are the same way, you never say “Man, he’s got a blazing kettle bell swing!”, same goes for box jumps and wall balls. So the only way to differentiate your time or show improvement is fewer breaks and less time spent in a low gear. So as John Mellencamp once sang “make it hurt so good”. I know seems like an odd collection, but remember I know what’s on the menu for tomorrow. Tim missed a new PR but made a fight of it the whole way. This doesn’t seem too bad, but you are not factoring in the special “warm-up” we did this morning or the heavy thrusters………then the WOD. Actually, the WOD was nice and fast and I like that. I’ve never done over 65lb thrusters, so I was very pleased with a 90lb max. 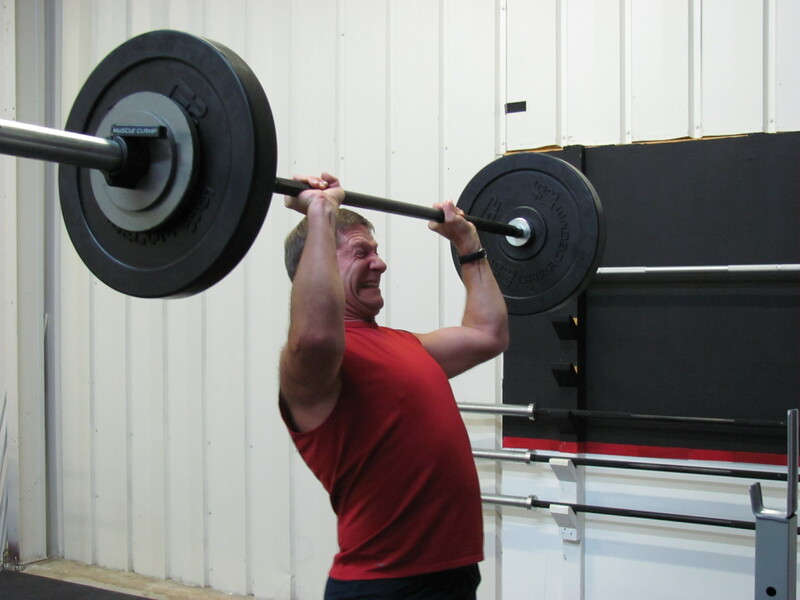 Brad, your thrusters were great, very impressive- so glad to have you at the Box. Jim and Zach great to have you guys back! NY & now Vegas? Wow you guys are jet-setters! G&C, Since you aren’t celebrating your anniversary, this trip really isn’t “all about you” and you won’t be gambling or drinking and there isn’t much else to do in Vegas- I would appreciate a CFLV t-shirt. No workout necessary, just get me a t-shirt -if it’s cute! Ran 400m in between rain showers, then did joint mobility. For warmup did the regular sit ups. Max wt on thrusters= 60lbs. Did Wod in 11:40 or 11:04 ( 25lb KB swing and 12″ box)forgot to write down the time. Was excited because I did this WOD- AS PERSCRIBED!!!! This is a first for me, Matt usually has to scale me down. I was wondering if I could keep it up for the wall balls, or would Matt change me over to goblet squats half way through. If I didn’t get that stich in my side hopefully my time would have been better. Fantastic work today. You guys cracked me up on the warm up, keep it fun it keeps me creative. Then several of you really upped your game on the heavy thrusters. Finally, several of you found new intensity on the WOD. Closing up tonight I saw at least 3 PR’s on the board, as a coach that’s better than peanut butter and chocolate (my highest praise is egg nog, so don’t get a big head). Laura thanks for letting me work out with you, you did a great job pushing me and it was fun (except for trying to read the watch while doing the sit ups). Yea I think I liked it better with you doing the work out with me…I think it made me try harder. Thanks! I’ll get those dang 160’s next time. Tim should have stayed & ran the watch for you, Matt & Laura! on the thrusters…I think I started at 75lbs then 95lbs then 105lbs and that’s the most I could do! I tried for 115lbs but didn’t make it this time! Hopefully I’ll be able to get that next time! I’ll be getting a journal book TODAY so I won’t have to go off of memory! Testing new Gravatar . . .